should I wager $0 or $1? In last night’s analysis, I suggested that Steve, the who led with twice second’s score, wager no more than $1 in case Melissa held back a dollar for some reason. This is the second such situation – a “lock-tie” in technical parlance – since the new tiebreaker rules went into effect in November 2014. The first was January 14; the leader wagered zero (risking the tiebreaker) and second place went all-in. The previous occurrence was July 8, 2014. It was a total disaster. Looking at J! Archive data, I see only 29 occasions in regular play (excluding last night) where second place had exactly half the leader’s total heading into Final. In one of those games, there was a tie for second. At the beginning of this season, I ran some stats for a feature on the Jeopardy! website. That means in circumstances where second place gets it right, first place will also get it right around 63% of the time – better than a coin flip. If you think you have a better-than-63% shot of winning a tiebreaker, feel free to bet zero and hope your opponent misses (either the clue or the proper wager). Otherwise, I’d play to win. Your comfort with the category might also come into play, as I discuss in the video I now put up every time there’s a wager-to-tie situation. As for that tie for second, Elin Gaynor committed a cardinal sin, depriving us the possibility of three-way co-champs in 1997. 0 ! 5,100 ! 5,100 ! b) If the second-place person gets it wrong, my best bet is also $0. The question then becomes: what are the odds that either I or the second-place person (or both) get it wrong? 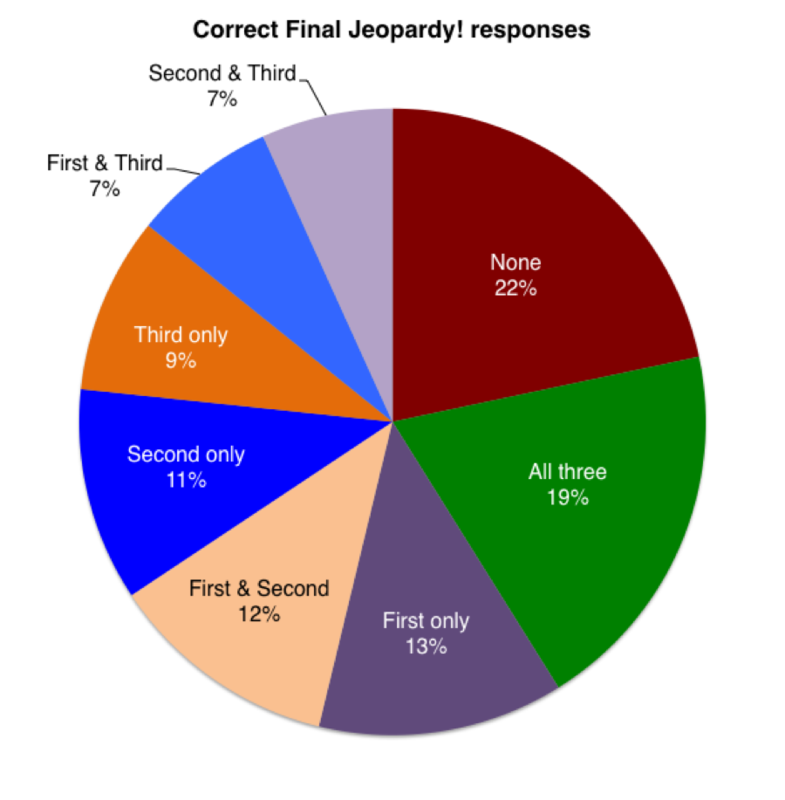 If we guess (generously) that each of us will get Final Jeopardy right 2/3 of the time, that makes it a 44.44% chance that we both get it right. That means that 55.56% of the time, $0 would be the best bet. Doesn’t it? And if we use the 48.4%-get-it-right number you calculated for that (excellent) Jeopardy! story, that would make it only a 23.4% chance we both get it right, and a 76.6% chance that betting $0 is the best move. Doesn’t it? I’m no mathematician, so I’m wondering where the flaw is here. You get FJ! right (regardless of whether or not second does). Both you and second miss FJ!. Second makes a bad wager when you miss FJ! and your opponent gets it (if that wager is everything but a dollar it’s a tiebreaker). That’s at least 3 out of 4 possible outcomes (and probably more because of the correlation of outcomes and the possibility of a bad wager). Second wagers properly and gets FJ! right – and you win the tiebreaker. Second makes any bad wager. Once again that’s at least a 3 out of 4 chance – but here you gain the slight benefit in the case of an everything-but-a-dollar bad wager at the (probably greater) expense of losing the correlation benefit if you both get FJ! right. The moral of the story is that in this situation either $0 or $1 is perfectly acceptable (and perhaps any amount that would not let third back in, but going for more than one dollar needlessly adds risk if second does make a boneheaded wager). If second place misses, your wager is irrelevant. Once you reach that point, that’s where you stop using brain power and focus on where the wager does matter.